Anjali Singh (Uzma Singh) is a professional with over 20 years experience in Finance & Marketing and also academics. She carries with her an MBA in (F&M) and is a NET qualified scholar. Coming from a family background of Civil Services and therefore having grown up in the various Districts across the Madhya Pradesh, Wildlife and Travel soon became a passion for her. In the year 2010, she decided to embark upon the journey of RJL, starting in the formative years, with a camping ground and thereafter gradually developing the infrastructure and the Lodge that we see today. The journey of RJL has been an challenging yet extremely happy and an exciting one, with absolutely no basic infrastructure like electricity and communications for the first four years of operations. It's only due to her perseverance and a single minded dedication to her vision, that we see RJL, in it's present form and in the process of traversing further. 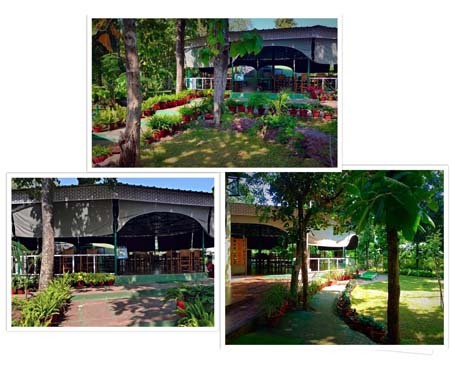 RJL is a Jungle & Wildlife Safari Lodge, situated barely 30 Kms from the City of Bhopal, on the fringes of the upcoming Ratapani Tiger Reserve, 200 meters from the Kolar Dam. Amidst beautiful and dense teak forests, an area inhabited by Tiger, Leopards, Wildcats, Sloth-bears Foxes, Hyenas, Deer's and Languor's, is The RJL, a quiet and quaint Jungle Jungle Lodge, spread over the edge of a cliff, overlooking the Kolar Reservoir and the beautiful Ratapani Jungles, in the valley below. As you drive up to the Lodge, through the dense woods and the beautiful Vindhyachal Ranges, the road itself sheltered under the thick canopy, you can't help but be awestruck by the sheer beauty of the pristine forest. Moving back to the lodge, as you step out into the verandah, you can't help but gasp at the beautiful sight offered by the Seven Large lawns, almost two acres of them, surrounded by the dense teak woods. Next to the Sunset Deck, steps, winding their way down, take you to a mini infinity pool, perched halfway on the hill, offering a panoramic view of the vast expanse of the forest and the reservoir below, the lovely tree canopy protecting you from the sun, as you splash about in the pool. In a short while itself, one feels at ease and at peace with nature and with one self, away from all the menace of the city. A place where one wishes to be with one's loved one's. A place where one feels rejuvenated, recuperated and energized. In a way a true "writer's paradise". Be it with family or with friends, one can simply sit in the Veranda's, the Lawns or the Gazebos and enjoy the quaint feel of nature, the distant feel of the forest and yes the wilderness..... As the dusk approaches, one is presented with the most magnificent sunset and as the dusk gives way to the night, one can only look up in awe and the beautiful canvas which the night sky has to offer. Never can one imagine so many star's, living in the City, those of us, however, who may still have some childhood memories of this spectacular astral display.well, this is an ideal place to be reminded of those special childhood memories and cherish and revisit them with family and friends. RJL is situated at the edge of one of the largest water bodies in the region. Quite naturally, between the months of late October till the End of March, this reservoir is home to a myriad of migratory water birds. Ducks, Crain, Geese of many varieties can be spotted merely by walking down the steps of RJL and along the reservoir edge, along the forest. The reservoir also draws the animals aplomb, as after November till the onset of monsoons, for a span of almost seven months, this remains the only watering-hole for the Carnivores and the Herbivores, in fact, the herbivores, many a times drawing the carnivores. The soft green grass along the reservoir and the damp soil creates an ideal feeding ground for the Herbivores, thereby attracting the carnivores looking for an easy prey. Therefore, an early morning or evening, dusk, walk along the reservoir can pleasantly surprise you at times with the wildlife you may come across. One also, therefore, has to be extra careful while walking outside the property. When we were young, I'm sure, in the many fairytales that we read, or were read out to us, there would have been many stories where the full moon was supposed to talk back at people. It was, "is" and shall perhaps remain forever, one of ...the most beautiful and hypnotic sights, there can be.At the RJL, as we approach the full moon, we are blessed by a sight, unparalleled by any. The locals, forest dwellers swear the moon is bigger in their area. However sweet that notion might be, a clear sky, devoid of dust and pollution ensures a sight like none other. Walk about inside the property, over the many pathways which we've made for you and you don't even require the lanterns, setup all along the walkways, to guide you.The fragrance of the night, the sound of crickets, Jungle Owlets, leaves fluttering in the gentle breeze, are there to give you adequate company. Do excuse the occasional cry of the Jackals, they do sound distressing at times, but wisely they keep their distance. Hamlet after hamlet in the forest area also make the most of the moonlit night. Be it poojas in the village temples or even at their chopals, the gentle, almost soothing sound of dhools and harmonium, flows through the night. Though a fair distance from the lodge, however, it remains visible and mildly audible, when one drives along. Just some of the experiences which we have somewhat forgotten about, living in the city, awaiting us at the RJL. With a beautiful hill as a backdrop, a lovely tree canopy above and the beautiful Kolar reservoir right up front, in all its glory, our campsite promises an experience, un-comparable to any. 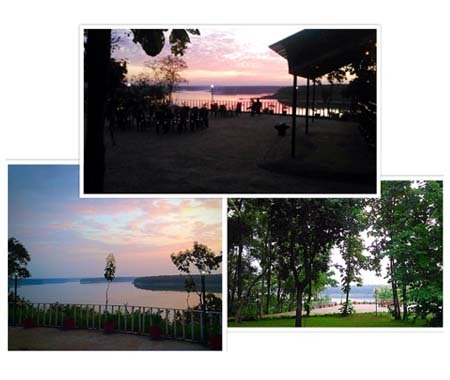 As one looks ahead, over the reservoir, an endless expanse of Ratapani Jungles, greets the eyes. Walk along the edge of the forest, along the reservoir, till one tires, share a beautiful conversation with your friends and family, or enjoy the enchanting Jungle evenings, as you walk along, for you never know what you'll encounter or if like it a bit brisker, cycle along. Take a walk into the jungle trails, under supervision, it is after all a jungle out there watch the most spectacular sunset from one of our decks, no conversation expected there, as we know it'll leave you quite spellbound and speechless. It'll soon be time to retire to the campfire and the tales of the day gone by. On a prior request, unplugged acoustics and vocals are made available and before you know it, it's time for dinner. Walk up to the Goolghar and enjoy the local cuisines and gourmet. After which we would definitely recommend a walk along our beautifully made walkways, within the property, beautifully lit with lanterns. As you retire into your tent, a spectacular interstellar display of stars would surely make it difficult for you to not indulge in stargazing and why not, like they say, there's a star out there for everyone. Early mornings are the best, the bird-calls being our morning alarms. Tea of your choice served at campsite and then we would encourage a walk, fresh crispy, fragrant, cool, forest breeze, greeting you every step of the way, though we won't mind if you simply wish to sit back, relax and enjoy the forest mornings, soaking in all its natural bounty.